Saudi Arabia - Crown Prince Nayef bin Abdul-Aziz, the hard-line interior minister who spearheaded Saudi Arabia’s fierce crackdown crushing al-Qaida’s branch in the country after the 9/11 attacks and then rose to become next in line to the throne, has died. He was in his late 70s. Nayef’s death unexpectedly reopens the question of succession in this crucial U.S. ally and oil powerhouse for the second time in less than a year. The 88-year-old King Abdullah has now outlived two designated successors, despite ailments of his own. Now a new crown prince must be chosen from among his brothers and half-brothers, all the sons of Saudi Arabia’s founder, Abdul-Aziz. The figure believed most likely to be tapped as the new heir is Prince Salman, the current defense minister who previously served for decades in the powerful post of governor of Riyadh, the capital. The crown prince will be chosen by the Allegiance Council, an assembly of Abdul-Aziz’s sons and some of his grandchildren. It also opens the possibility of moving a member of the so-called “third generation” - the grandchildren of the country’s founding monarch - one step closer to taking the leadership of one of the West’s most crucial Arab allies. A statement by the royal family said Nayef died Saturday in a hospital abroad. Saudi-funded pan-Arab TV station Al-Arabiya later confirmed he died in Geneva. Nayef had been out of the country since late May, when he went on a trip that was described as a “personal vacation” that would include medical tests. He travelled abroad frequently in recent years for tests but authorities never reported what ailments he may have been suffering from. Nayef had a reputation for being a hard-liner and a conservative. He was believed to be closer than many of his brothers to the powerful Wahhabi religious establishment that gives legitimacy to the royal family, and he at times worked to give a freer hand to the religious police who enforce strict social rules. His elevation to crown prince in November 2011, after the death of his brother Sultan, had raised worries among liberals in the kingdom that, if he ever became king, he would halt or even roll back reforms that Abdullah had enacted. Nayef had expressed some reservations about some of the reforms by Abdullah, who made incremental steps to bring more democracy to the country and increase women’s rights. Nayef said he saw no need for elections in the kingdom or for women to sit on the Shura Council, an unelected advisory body to the king that is the closest thing to a parliament. His top concern was security in the kingdom and maintaining a fierce bulwark against Shiite powerhouse, Iran, according to U.S. Embassy assessments of Nayef. “A firm authoritarian at heart,” was the description of Nayef in a 2009 Embassy report on him, leaked by the whistleblower site WikiLeaks. Nayef, who was interior minister in charge of internal security forces since 1975, built up his power in the kingdom though his fierce crackdown against al-Qaida’s branch in the country following the Sept. 11, 2001 attacks in the United States and a broader campaign to prevent the growth of Islamic militancy among Saudis. The 9/11 attacks at first strained ties between the two allies. For months, the kingdom refused to acknowledge any of its citizens were involved in the suicide airline bombings, until finally Nayef became the first Saudi official to publicly confirm that 15 of the 19 hijackers were Saudis, in a February 2002 interview with The Associated Press. In November 2002, Nayef told the Arabic-language Kuwaiti daily Assyasah that Jews were behind the Sept. 11 attacks because they have benefited from subsequent criticism of Islam and Arabs. Nayef came under heavy criticism in the U.S., especially because he was the man in charge of Saudi investigations into the attack. Criticism grew in the United States that the Saudis were not doing enough to stem extremism in their country or combat al-Qaida. In mid-2003, Islamic militants struck inside the kingdom, targeting three residential expatriate compounds - the first of a string of assaults that later hit government buildings, the U.S. consulate in Jiddah and the perimeter of the world’s largest oil processing facility in Abqaiq. Al-Qaida’s branch in the country announced its aim to overthrow Al Saud royal family. The attacks galvanized the government into serious action against the militants, an effort spearheaded by Nayef. Over the next years, dozens of attacks were foiled, hundreds of militants were rounded up and killed. By 2008, it was believed that al-Qaida’s branch was largely broken in the country. Militant leaders who survived or were not jailed largely fled to Yemen, where they joined Yemeni militants in reviving al-Qaida in the Arabian Peninsula. Nayef took a leading role in combatting the branch in Yemen as well. In 2009, al-Qaida militants attempted to assassinate his son, Prince Muhammad, who is deputy interior minister and the commander of counterterrorism operations: A suicide bomber posing as a repentant militant blew himself up in the same room as the prince but failed to kill him. The cooperation against al-Qaida both in the kingdom and in Yemen significantly boosted ties with the United States. The anti-militant campaign also boosted Nayef’s ties to the religious establishment, which he saw as a major tool in keeping stability and preventing the spread of violent al-Qaida-style “jihadi” theology. The Wahhabi ideology that is the official law in Saudi Arabia is deeply conservative - including strict segregation of the sexes, capital punishments like beheadings and enforced prayer times - but it also advocates against al-Qaida’s calls for holy war against leaders seen as infidels. Nayef’s Interior Ministry allied with clerics in a “rehabilitation” program for detained militants, who went through intensive courses with clerics in “correct” Islam to sway them away from violence. The program brought praise from the United States. 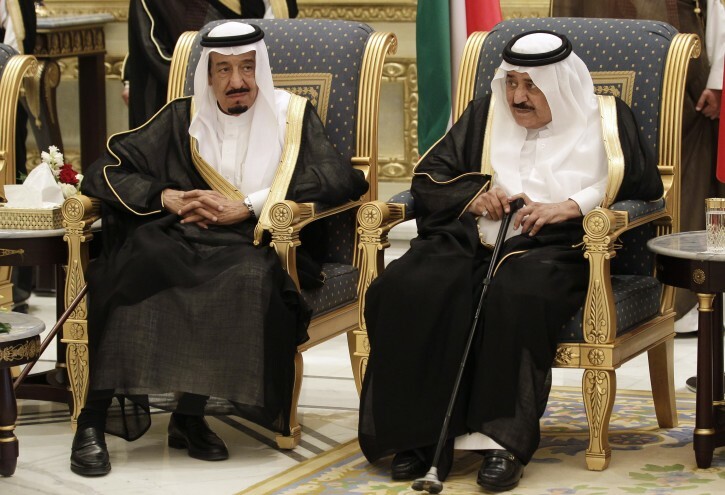 Nayef never clashed with Abdullah over reforms or made attempts to stop them - such a step would be unthinkable in the tight-knit royal family, whose members work hard to keep differences under wraps and ultimately defer to the king. But Nayef was long seen as more favorable to the Wahhabi establishment. In 2009, Nayef promptly shut down a film festival in the Red Sea port city of Jiddah, apparently because of conservatives’ worry about the possibility of gender mixing in theaters and a general distaste toward film as immoral. Nayef, a soft-spoken, stocky man of medium build, was born in 1933, the 23rd son of Abdul-Aziz, the family patriarch who founded the kingdom in 1932 and had dozens of sons by various wives. Nayef was one of the five surviving members of the Sudairi seven, sons of Abdul-Aziz from his wife Hussa bint Ahmad Sudairi who, for decades, have held influential posts. That made him a half-brother of King Abdullah. Before being appointed interior minister, he held the posts of Riyadh governor, deputy minister of interior and minister of state for internal affairs. Nayef has 10 children from several wives. Good news. Should be the first of many. If they're looking for an heir, I'll throw my hat into the ring. Its good to be the Crown Prince! The Royal Family's Council will come up with another candidate soon enough. It's not like they're short of Princes. Saudi Arabia is perhaps the largest family business on the planet. It has a horrid human rights record. And the amount of inbreeding (from first cousins marrying first cousins) leaves one to question the viability of the gene pool. I spent 2 1/2 years there before and after the first Gulf war. It's a scary place. I have spent 15 years here. The inbreeding has some small effect (lots of diabetes, some blood disorders), but it is easy to exaggerate. Nayif (a.k.a Scary Spice) did a great job in suppressing Al Qadea here. He used carrots and sticks with a great deal of energy. You know it is remarkable what you can get with that combination. Do not forget the people OBL was really after was the Saudi royal family. Nayif crushed them here and in nearby countries.